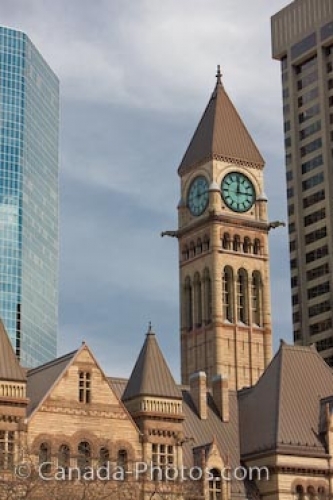 Beautiful details of the old city hall and its clock tower shows it timeless age among the tall modern buildings. The clock tower stands high above the city hall building. Modern buildings of downtown Toronto surround the city hall. The different types of architecture adds to the beauty of downtown Toronto. Make sure to see our photo gallery Toronto city pictures. Old architecture of the town hall and its clock tower, Toronto, Ontario.